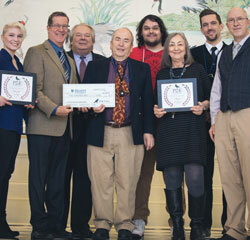 On Friday, January 19, the anniversary of Edgar Allen Poe’s birthday, organizers from the film festival named after the author of American literature — the Poe Film Festival — visited Regent University’s campus in Virginia Beach, Virginia, to award the university $500 for the grand prize Jarrod Anderson ’20, School of Communication & the Arts (SCA), won in their competition in November 2017. Although he wasn’t judging any of the competition, Sinnenberg described Anderson’s film as “remorse redemption,” and that it demonstrated “perfect film narration,” and was “almost exactly what we were looking for” in regards to the how the plot was paced. “It tells a story really well,” he added. So why theme a film competition around Edgar Allen Poe, an author who died more than 150 years ago? “What Edgar Allen Poe teaches us, is that the most important thing a writer can do, whether it’s [in] a short story, a novel, or even a movie … was to evoke an emotional response in the viewer or reader,” said the festival director Brian Weakland. Maintaining “intensity,” something Poe did, is a vital piece in this emotive style of storytelling and an element the festival looks for in films submitted by students, Weakland said. Regent student films “Ticking Hearts”, directed by SCA alumnus Nick Moon ’17, and “Monday”, directed by College of Arts & Sciences alumnus Chenzy Graziano ’15 both made final selections stage.